Which way would you hang (or wear) this art? 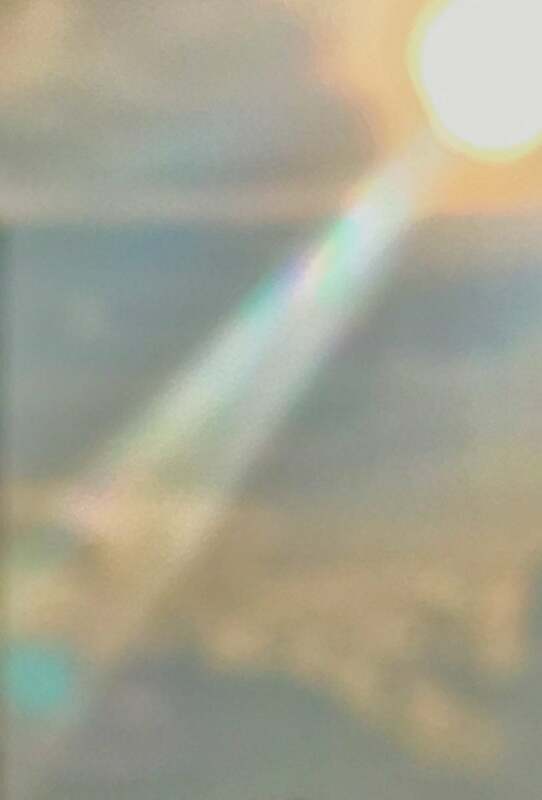 The orientation of the image is important. To ensure maximum viewing pleasure place this side (with the image on it) so that it faces the audience. Placing the art so the image faces away from the viewer may make it difficult to see. Available as prints, apparel and other formats from Society6 and RedBubble. 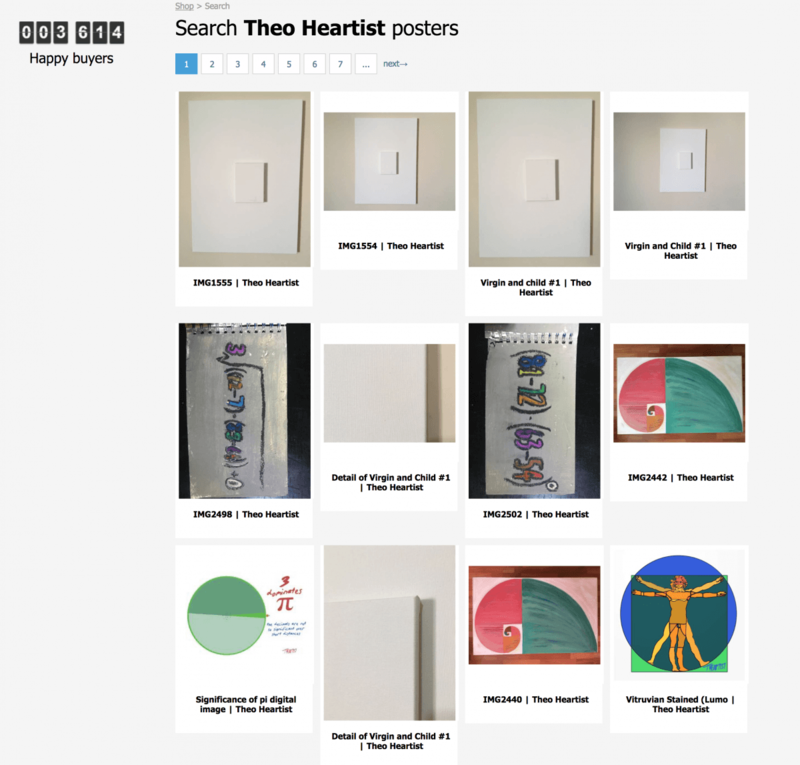 I came across a scammy website that is selling pirated posters of my art for prices lower than their shipping costs. It appears that they capture images from websites and their goal is to phish photographers and artists when they try to take down their copyrighted images. Conveniently they are “Out of stock” of posters of my work. I won’t reveal the name or address of the scam website because I doubt that they would actually send you a poster. I am posting a screenshot here of the copyright offender’s page and I expect that will reappear there as a recursive poster in the future. Wanna buy a poster of my coffee table? Or a poster of my book cover? Don’t buy from these scammers. The coffee table is not for sale. 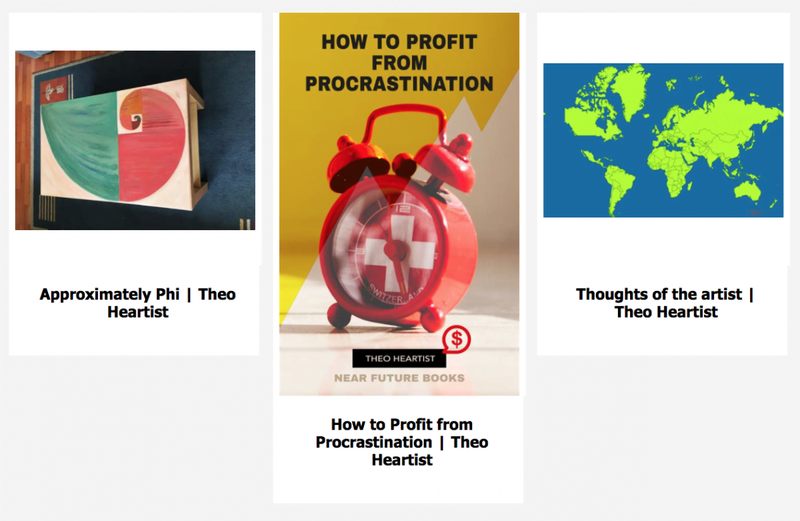 Buy the How to Profit from Procrastination e-book on iBooks and get future editions for free. If you do want to buy a print of my art, check out genuine items I have for sale on Society6, Redbubble, or ArtPal. Where are the cool evening walks and the lovers in the park? Then there are seasons which have arbitrary beginnings and ends (See Too many winters). I could make plans and resolutions for those times. Or maybe I could make plans at the start of each new month and try to keep a habit for 30 days. I usually find myself procrastinating the making of resolutions until the next significant date on my calendar. This Christmas, 77% of my close extended family is getting together to celebrate and my mother has asked that her children and grandchildren create decorations. With the short notice and the long distance between us, I have created this DIY papercraft Santa decoration that you might like to make yourself. Santacraft yourself, Digital design (A4). 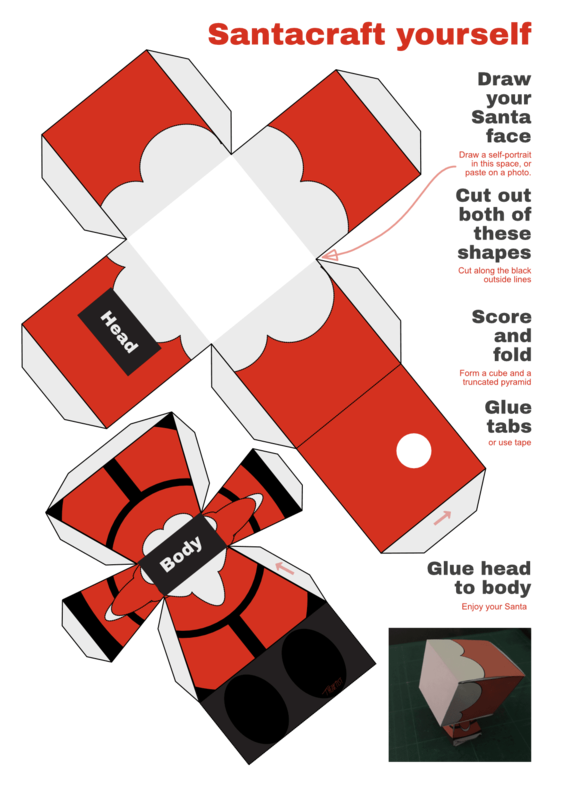 Download the Santacraft yourself PDF, print it out and create your own last-minute Santa decoration. I am in the midst of my 53rd Winter. So far I have experienced 50 Autumns and 48 Springs, but only 47 Summers. How old am I? Why am I procrastinating Summer? One of the benefits of international travel is that I can spend time in different hemispheres, experiencing the different food, culture, and people of the world. I grew up in the Southern Hemisphere where Christmas is in Summer and the school year matches the calendar year. But, 14 and a bit years ago I moved to the Northern Hemisphere for work and a different lifestyle. I now get a real Winter Christmas and the academic year spans two calendar years with a long break in the Northern Hemisphere Summer/Southern Hemisphere Winter. One of the drawbacks of living on the other side of the equator from family and friends is the opposite seasons. With my immediate family in school, our local long Summer break is the only practical time for us to visit our antipodean whanau, who are then in the midst of their Winter. 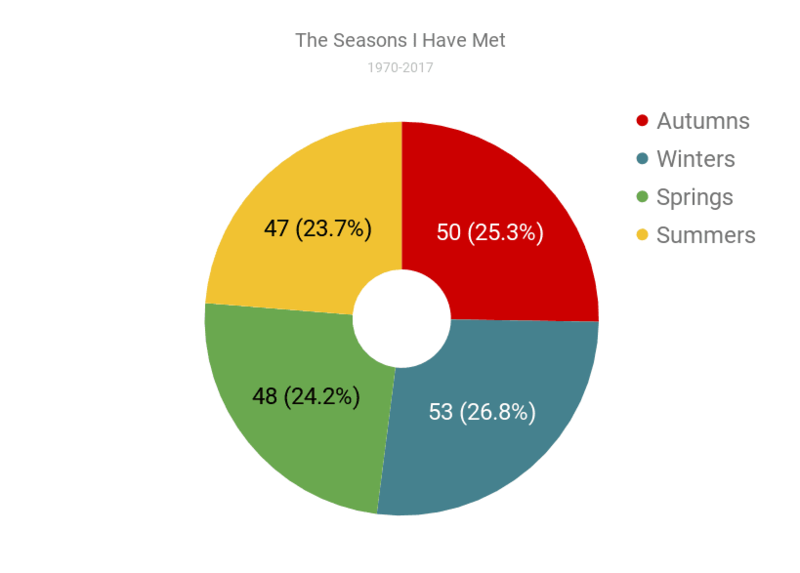 Unseasonal days experienced during the season have not been counted, only prolonged exposure to the season experienced by the rest of the hemisphere at that time. For the purposes of my calculations, a season is counted if I was in a hemisphere experiencing any part of that season at the time. 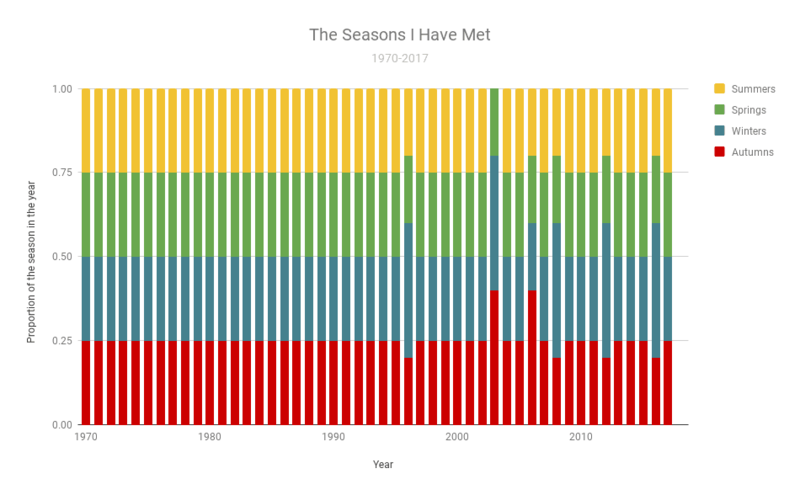 If I visit an opposite season and return before the end of the original season, the original season is only counted once – for example, I left the Northern Hemisphere Summer in June 2016, had four weeks of Southern Hemisphere Winter and returned to experience the remainder of the Northern Hemisphere Summer; earlier/later in the year I had another whole Northern Hemisphere Winter. I have only counted a season if I experienced it for at least one week – I do not remember any of the 21.5 hours of the summer of my birth. Sometimes it is good to have a rest from creating art. But then getting back into creating art again can be a struggle and a battle. Rest wants a bit more time. Art wants to return. Procrastination sets in. In this quirky typography animation, rest and art battle for attention. Faux parfum – Would you buy these fragrances? French is a pretty language. A flowery language of love and romance. As an exercise in 3D modelling, I created and rendered these perfume bottles. 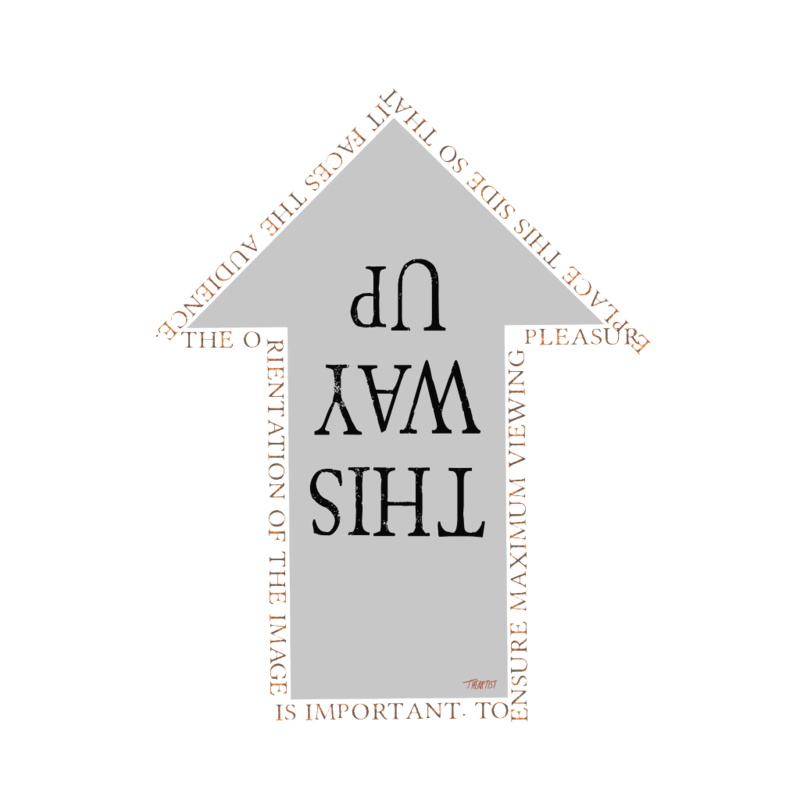 The translation of the labels is left as an exercise for the reader. The design of the bottles gives a clue to the fragrance they could contain. Can you solve these simple equations and find the pattern? This was the question I posed to friends on Facebook. Thanks to them I found some missing brackets and corrected the above image, representing digits as equations. From this, I created a simple book reminiscent of a child’s counting book or math exercise book with a number represented on each page by its equation. 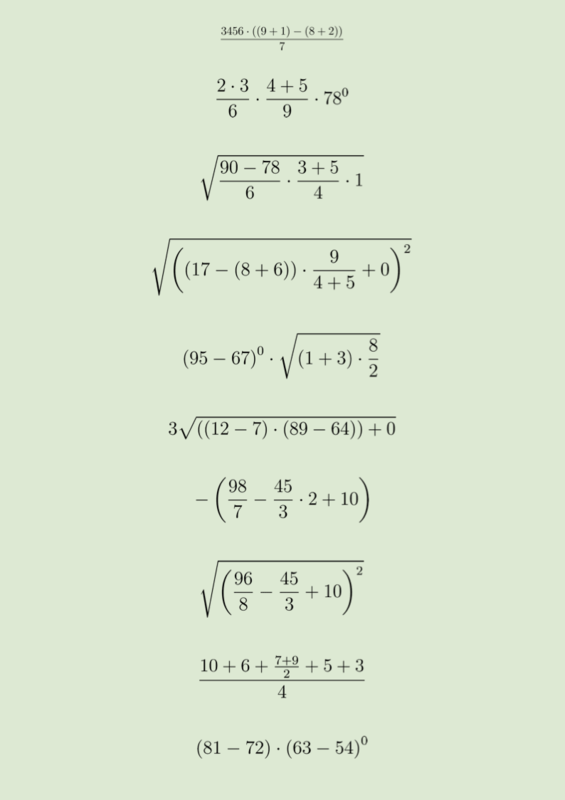 If you include the answers to the equations (left as an exercise for the reader), each statement has all of the digits from zero to nine appearing only once. I created the book from a school desktop flip calendar, giving it a distressed old school look by painting the pages with a mixture of gouache and acrylic house paint. Letting the wet pages stick together before separating and applying a second coat produced the rough surface for the equations in pastel, sharpie and pencil. The title of this work No. Digits is a play on the idea that “Number” is often abbreviated as “No.” and for each equation there is no digit for that specific number until you solve the equation. What would happen if certain countries did not exist? One of the items in Theo’s procrastination list (since 2014) is an geographical education computer game called Country Thief. 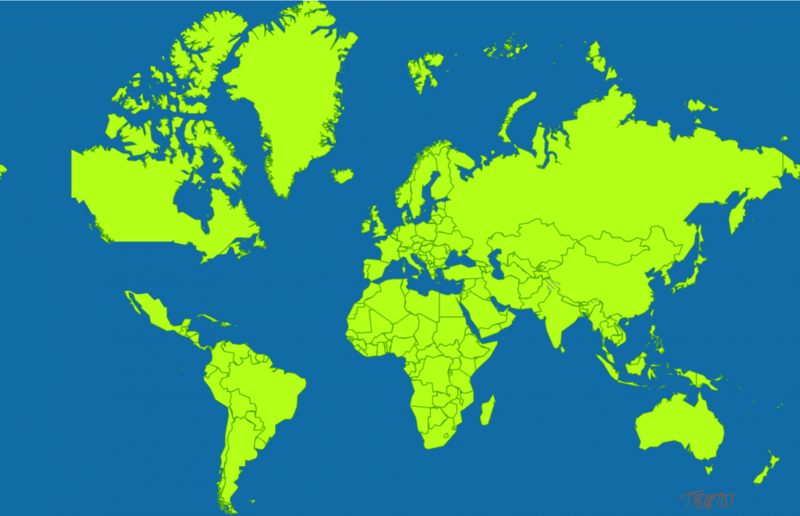 As someone who comes from a country (New Zealand) that is often left off global maps, I decided to create a game where countries are disappearing from the map for various reasons (evil dictators, nuclear war, economic collapse, alien invasion, meteors of unusual size and shape, global warming). Players race against decreasing time limits to find the missing country and identify it. Can you beat the clock and save your country from disappearing? Given recent current events and environmental concerns, I am releasing this concept design image for people to share on social media and make their own comments. 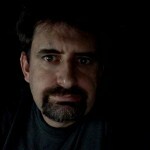 Proudly powered by WordPress Theme: Qwerty Child.